Imperial is a leading distributor of quality maintenance repair parts since 1958. 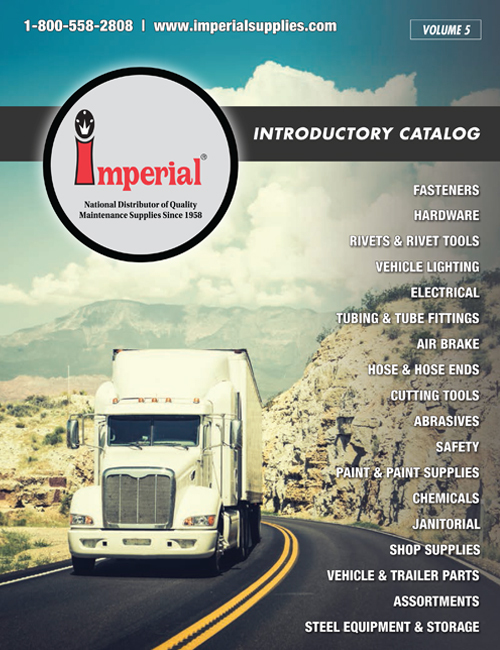 Imperial is a progressive, technologically­­-driven distributor of fleet maintenance products and inventory management programs. It’s their mission to provide you with an efficient, effective system for ordering and stocking fleet-specific maintenance repair parts—a system that will help you keep your vehicles on the road, control your costs, reduce the hours your shop personnel spend with vendors, and improve your bottom line. TruckersB2B is here to help you save up to 25% with Imperial Supplies. Save time and money, and easily find products. Larger product selection at a lower cost. Local stores have limited shelf space meaning the product selection can be limited. Imperial stocks the widest selection of sizes, colors, brands, and products to choose from—at lower costs than conventional brick and mortar stores. Tech specs at your fingertips. Find exactly what you need and don't settle for the product that is just close enough. Manufacturer technical specifications are readily available which makes researching your product fast and easy. Use the Imperial Mobile App or imperialsupplies.com to place your order 24/7 without having to drive to multiple stores. Place your order before 2 p.m EST M-F and it ships that same day from one of Imperial's four strategically located distribution centers. Pay one flat fee of $49 and receive FREE ground shipping for one year on all orders over $100*. Save even more with TruckersB2B. Members save up to 25% on fleet maintenance supplies with Imperial. Start saving up to 25% with Imperial Supplies by calling 888.937.6334 or filling out the form below. Once your account has been linked to the TruckersB2B discount, you can simply order your supplies from Imperial and get the savings. Ordering from Imperial is quick and easy. Download the Imperial Mobile App—Search, browse and purchase fleet maintenance supplies conveniently while on the go. Download the app here. Flexible ordering options—Place your order via the Imperial Mobile App, over the phone, through imperialsupplies.com or send it in by fax. Dedicated customer service—An Imperial Service Advisor dedicated to your location is always there to help. The Important Stuff: Not applicable to customers who already have a special pricing program or national account established with Imperial Supplies. *Imperial Supplies Shipping Saver Offer applies to orders from Imperial shipped by ground method to the 48 contiguous states. This offer does not apply to special orders, express and international shipping, orders that require special handling and orders that include items shipped by motor freight. Imperial reserves the right to discontinue offering the Shipping Saver Offer to customers/prospects at any time. Cancellation and full refund of $49 will only be allowed if cancellation is requested before any qualifying product purchases have been made. Once any products have been shipped under the terms, no fees will be refunded.